A bit before I showed up unceremoniously in ’64, screaming for attention and throwing in a jaundice for effect, my dad had served as a paratrooper in the French army and landed in Algeria, a messy colonial war that left him scarred for the rest of his short life. 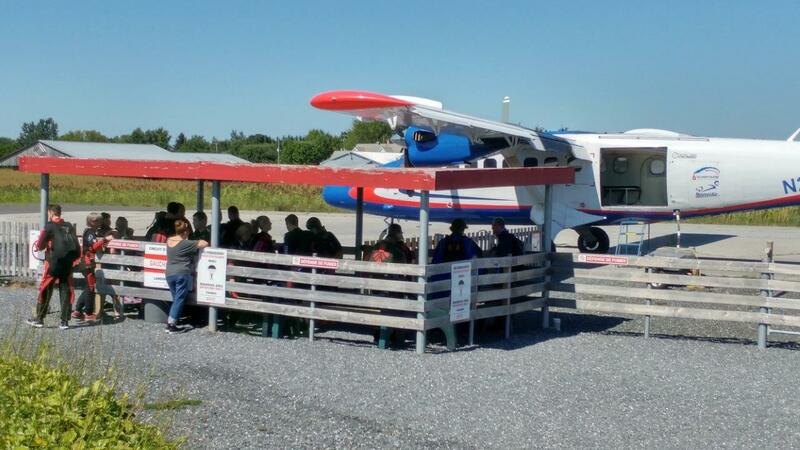 Many decades later, juggling the mid-eighties and my mid-twenties, and having failed to hustle work as a commercial pilot, I turned to skydiving as an upward escape despite its definitive association with gravity. 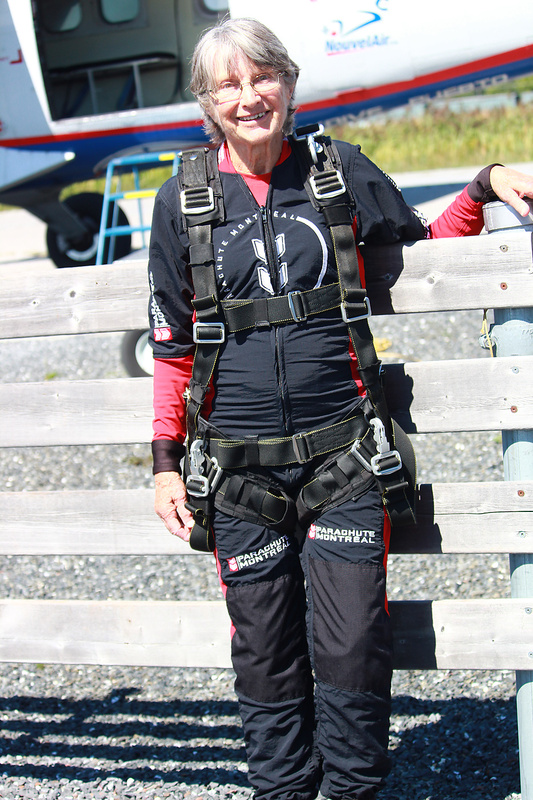 I was out-budgeted from the start and gave up after eleven static line jumps, one short of my first free fall. Years passed and having preceded me underwater, my sister Brigitte also started jumping. I could see a pattern. We had the genes. 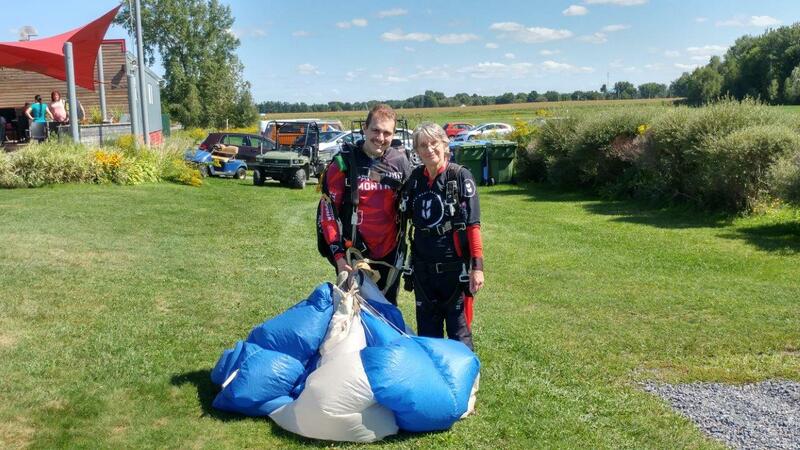 Well last week, putting down her quantum physics book and deciding that hopping out of a plane into thin air was something to be experienced once, it was our mother’s turn to go skydiving. She was casually curious about the whole thing, about that fall and what her sensations would be. Before you ask, she looks my age but is eighty-one. She signed up with Parachute Montréal and on a sunny afternoon, put on a jumpsuit, strapped on a harness, climbed aboard a doorless Twin Otter with a dozen others, ascended to thirteen-and-a-half thousand feet where the air is already so thin that aircraft are only allowed there for thirty minutes before oxygen is mandatory, hooked up to Simon, her tandem instructor, and after the turboprop had lined itself up and slowed down, upon a final Go!, jumped out and fell. At terminal velocity or about one-hundred-and-twenty miles per hour, the free fall was almost a minute long. Once Simon had opened their chute, they glided a few more minutes towards the LZ, discussing the scenery. A flare. Touch down. Then it was over. Long after our roles have been reversed and the child in me has marginally taken over as an adult, my mother just managed to yet again teach me a valuable lesson: it is never too late to jump. So much of my own life right now is bogged down by procrastination, hesitation, fear and doubt, the lesson is timely. All it takes to jump is curiosity, courage, and one small step. I shall keep that mind. The pictures are not mine, they are my uncle Jos’ and Parachute Montreal’s own. Kudos and love to the jumper! Well, he looks more rattled then her! reply Well, for once the example came from down below : my two kids are exceptional, what choice did I have ? reply Adventurous spirits definitely run in the family veins! Brava! to your maman. reply She is an inspiration for all of us! reply Thank you all for your encouragements and sweet posts. Leslie, it happens so fast that you don't have time to really realize what's happening. When the parachute opens, then you start to. For my next jump, I'll be able to enjoy more consciously that free fall I wanted so much to experience. Love to all of you. reply Wow! So proud of your mother! A gutsy lady. I'll dive with you any time,, but not jumping out of perfectly good planes for me! Congratulations to your mother! reply This is wonderful... I’m also a child of 1964 and I found this very moving and inspiring. What a woman!